In these terms and conditions (which are referred to in this document as “these terms”), “Customer” means the customer for whom the Works are to be carried out by ASPECT, “ASPECT” means Aspect Maintenance Services Limited (“AMSL”) or, as the case may be, a franchisee of AMSL carrying on business pursuant to a Franchise Licence Agreement entered into with AMSL, “Contract” means the agreement between the Customer and ASPECT to carry out the Works of which these terms form a part and (where these terms are a schedule to a signed agreement between the Customer and ASPECT) that agreement, “Works” means the works described in ASPECT’s estimate and/or as referred to in ASPECT’s Work Detail Sheet or any other document or email issued by ASPECT, as may be varied by agreement in writing between the parties. For the purposes of these terms, “in writing” and “written” include by email and any document which is set out in a hand held device and any signature on a hand held screen shall be treated as in writing. In these terms words importing the masculine gender also include the neuter and the feminine gender and words importing the singular number include also the plural number, where the context so requires. 2.1 The Customer will be treated as an Account Customer or a Non-Account Customer, according to ASPECT’s reasonable discretion. 2.2 All estimates given by ASPECT, all orders and instructions given by the Customer, and all work authorisations, are governed by these terms. They supersede any other terms appearing elsewhere and override and exclude any other terms stipulated or incorporated or referred to by the Customer, whether in the order or instructions or in any negotiations or in any course of dealing established between ASPECT and the Customer, except where these terms are a schedule to a signed agreement between the Customer and ASPECT, in which event these terms apply only to the extent not inconsistent with that agreement. 2.3 The Customer acknowledges that ASPECT has not made any representations (other than any expressly stated in the Contract and/or in ASPECT’s estimate) which have induced it to enter into the Contract and the Contract shall constitute the entire understanding between the Customer and ASPECT for the performance of the Works. 2.4 No modification to the Contract shall be effective unless made by an express written agreement or email exchange between the parties. The signing on behalf of ASPECT of any documentation of the Customer shall not imply any modification of the Contract. 3.1 Unless ASPECT provides the Customer with a written estimate which is accepted by the Customer in accordance with its terms, all Works will be charged on the basis of ASPECT’s standard Rate Card applicable at the time the Works are carried out. 3.2 Any estimate by ASPECT is subject to withdrawal by ASPECT at any time before receipt of an unqualified acceptance from the Customer and shall be deemed to be withdrawn unless so accepted within 28 days from its date. 3.3.2 if prior to carrying out the Works, there is an increase to ASPECT of more than 10% in the cost of any relevant parts, materials or other items, equipment hire or transport since the date upon which ASPECT’s estimate was provided, ASPECT reserves the right to inform the Customer and to provide a revised estimate incorporating that increase. In this event, the revised estimate will apply unless the Customer cancels the Contract before the Works are begun or, if earlier, within 48 hours of the revised estimate being provided. 3.4 For materials, parts or other items that are not carried as part of ASPECT’s standard van stock, unless it is with respect to Works for which there is an estimate which includes all collection fees, ASPECT charges a fixed collection fee of £50 plus VAT. Where an item is not easily sourced or generally held by the major suppliers used by ASPECT and it considers that significant time will need to be spent tracing and then collecting it, ASPECT will inform the Customer in advance and, unless the Customer sources the item itself, this will be charged on a time basis as per ASPECT’s standard Rate Card. It should be noted that this is an infrequent occurrence. 3.5 ASPECT’s standard Rate Card is available for inspection both on ASPECT’s website (www.aspect.co.uk) and at ASPECT’s premises during normal business hours. The Rate Card specifies half hourly rates. There is a minimum charge of one hour. Subject to that, charges are made by the half hour, rounded up to the next half hour. 3.6 Unless otherwise stated, the price and all estimates provided by ASPECT are shown exclusive of Value Added Tax which will be payable in addition, where properly chargeable. 3.7 If the Works involve a diagnostic process to ascertain the cause or source of a fault or breakdown and during that process an item is ascertained by ASPECT to be faulty and is replaced, the Customer will be liable to pay for that replacement even if the breakdown was caused in whole or in part by a different fault. 3.8 Aspect will be entitled, in accordance with market practice, to charge a mark-up on any parts, materials and other items supplied by it, subject to a maximum mark-up of 65% of the actual cost paid by ASPECT for the relevant item. The mark-up will reflect, at ASPECT’s sole discretion, the level of trade or other discount that ASPECT was able to obtain from the relevant supplier. 4.1 Non-Account Customers: Payment by the Customer is due on completion of the Works. Payment must be made on such completion. 4.2 Account Customers: ASPECT will seek to submit invoices to the Customer within 14 days of completion of the Works and, subject to paragraph 11 below, payment must be made by the Customer within 30 days after the date of issue of the invoice. 4.3 Snagging: Where the Works have been completed subject to snagging, 95% of all amounts outstanding must be paid on such completion and the Customer must provide access to ASPECT without delay to enable the snagging to be finalised. The balance of 5% will become payable upon the finalisation of the snagging or, if access has not been made available to carry out the snagging within 14 days of completion, at the expiry of such 14 day period. 4.4 Where the Customer is represented by a third party (such as a managing agent, tenant or other occupier, contractor or other representative), in the event of non-payment by the Customer, the third party will be responsible for payment unless ASPECT has agreed otherwise in writing. 4.5 In the case of consumer Customers, ASPECT shall be entitled to interest on a daily basis on any amount not paid on the due date for payment from such due date until payment in full at 4% above the Bank of England base rate at the relevant time together with such charges as may be incurred by any collection agent appointed by ASPECT (with a minimum of £40 plus VAT in the case of amounts below £1,000 and a minimum of £75 plus VAT in the case of amounts of £1,000 or more). In the case of commercial Customers, ASPECT will apply all relevant interest and charges as applicable under the Late Payment of Commercial Debts (Interest) Act 1998 as amended and supplemented from time to time by Government legislation or regulation. 4.6 ASPECT shall not be required to issue or deliver any certificates, guarantees or other similar documents regarding the Works until payment has been made in full. 4.7 Title in all parts, materials and other items supplied by ASPECT shall not pass to the Customer until payment for the Works has been made in full. All descriptions, illustrations, etc. contained in any catalogues, price lists or advertisements, or otherwise communicated to the Customer, are intended merely to present a general idea of the Works and nothing contained in any of them shall form a part of the Contract. Dates specified for the commencement and completion of the Works are estimates only. ASPECT shall use all reasonable endeavours to ensure that it will attend on the date and time agreed. However, it accepts no liability in respect of non attendance or late attendance on site or for the late or non-delivery of materials. Time shall not be of the essence of the Contract except as provided in paragraph 15 below. 7.1 It is the responsibility of the Customer to obtain all permits, licences and other consents in connection with the Works unless ASPECT agrees otherwise in writing. The Customer shall provide clear access to enable ASPECT to undertake the Works and will make all necessary arrangements with the proper persons or authorities for any traffic controls and signals required in connection with the carrying out of the Works. 7.2 The Customer will at all times provide a safe working environment for ASPECT and its employees, agents and sub-contractors for the purposes of carrying out the Works. ASPECT will not be required to enter any property when they are occupied but the only occupant is a minor. 7.3 The Customer will provide all necessary power and a clean water supply for ASPECT’s use in the execution of the Works. 7.4 Where applicable to drainage works, the Customer will provide, if possible, a plan showing drain layouts. If this is not available, ASPECT reserves the right to render additional charges at the relevant applicable rate in accordance with paragraph 3 above if a blockage occurs in drains not covered by the specifications or if it is necessary to trace unidentified drains to complete the Works. 7.5 The Customer must obtain any permission for ASPECT to proceed over property belonging to third parties if this is necessary for the proper execution of the Works and shall obtain any permission necessary to carry out work on property belonging to third parties. The Customer shall indemnify ASPECT against all claims of whatsoever nature made by such third parties arising out of the presence of ASPECT its employees, agents or sub-contractors on the Customer’s or such third parties’ property save where such claim results directly from negligence on ASPECT’s part. The Customer shall be liable to ASPECT for all loss or damage whether direct, indirect or consequential which is suffered by ASPECT as a result of failure or delay by the Customer in performing the obligations referred to in this paragraph. ASPECT will not be liable for any fracture found in frozen pipes attended by ASPECT. ASPECT will not guarantee to clear blockages occurring in a frozen pipe or drain. ASPECT will use all reasonable endeavours to carry out the Works on the agreed dates but shall not be under any liability to the Customer if it should be either impossible or impracticable to carry out the Works on the agreed dates or at all, by reason of strike, lock out, industrial dispute, act of God or any other event or occurrence beyond ASPECT’s control. 11.1 The Customer shall inspect the Works as far as it is reasonably possible to do so immediately upon their completion (though failure to countersign the relevant Works Detail Sheet shall not imply rejection of the Works) and, if it considers that the Works or any part thereof are not in accordance with the Contract, it shall within 7 days from the date of inspection give detailed notice in writing thereof. In the absence of any such notice, the Works shall be conclusively presumed to be complete and free from any defect which would be apparent on reasonable examination. 11.2 If the Customer gives ASPECT a notice that the works or any part thereof are not in accordance with the Contract, as per paragraph 11.1 above, ASPECT shall be given access the site to examine the complaint and, if ASPECT agrees that the Works were not completed in accordance with the Contract, to make good, at ASPECT’S own cost and expense, any defect. If ASPECT does not agree with the Customer’s complaint, the Customer shall be entitled to refer the matter to the relevant trade accreditation body (of which a list is maintained on ASPECT’s website), with a view to mediation in accordance with the recommendations of the body, failing which the Customer shall be deemed to have withdrawn its complaint and shall be obliged to make payment in full for the Works in accordance with paragraph 4 above. If the Customer involves a third party contractor prior to giving ASPECT a reasonable opportunity to correct any agreed defect or prior to exhausting the procedure recommended by the relevant accreditation body, any such involvement shall be at the Customer’s own cost and expense and ASPECT shall be entitled to payment in full in accordance with paragraph 4 above. 12.1 Subject to paragraph 11 above and the exclusions listed in paragraph 12.4 below, ASPECT undertakes to repair or make good any defect in completed work which appears within 12 months of completion of the same to the extent that such defect arises from a breach of ASPECT’s obligations under the Contract and provided that details of the defect are notified by the Customer to ASPECT in writing within such period and that ASPECT and its insurers are given the opportunity of inspecting the work and the alleged defect. This undertaking shall only apply to work carried out and completed and invoiced by ASPECT and which is paid for by the Customer by the due date for payment ascertained in accordance with paragraph 4 above. 12.2 If ASPECT returns to the site at the Customer’s request to review a claim under this undertaking and it transpires that the defect had not arisen as a result of a breach of the Contract on the part of ASPECT, ASPECT reserves the right to charge the Customer for the visit at its standard rate as per paragraph 3 above. 12.3 ASPECT reserves the right not to carry out any work under this paragraph 12 where the Customer cannot evidence that the work was originally carried out and completed by ASPECT or where payment has not been made in full for such work. – Parts, materials and other items will be provided only with the benefit of the manufacturer’s and/or supplier’s guarantee, and are not guaranteed by ASPECT. – Systems or structures not installed by ASPECT. – Any recall arising from circumstances or factors known to the Customer but not notified or disclosed to ASPECT prior to the work having been undertaken. – Defects resulting from misuse, willful act, or faulty workmanship by the Customer or anyone working for or under the direction of the Customer (other than ASPECT). – Any roofing work where ASPECT advises that the overall condition of the roof is poor and is in need of more extensive work and the work to be undertaken involves less than 20% of the area of the roof. 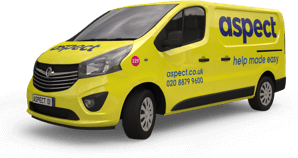 – Any work to repair an existing lock, or to fit any lock not supplied by ASPECT. 13.1 These terms set out ASPECT’s entire liability in respect of the Works and ASPECT’s liability under them shall be in lieu and to the exclusion of all other warranties, conditions, terms and liabilities, expressed or implied, in respect of the Works and the quality thereof. – The repair or making good of any defect pursuant to its undertaking in paragraph 12 above and subject always to paragraph 11 above. – Liability for death or personal injury resulting from negligence in the course of carrying out ASPECT’s duties. – The reasonable costs of repair or reinstatement of any loss or damage to the Customer’s property if such loss or damage results from ASPECT’s negligence or that of its employees, agents or sub-contractors and the Customer incurs such costs. ASPECT will not be responsible for damage suffered to a part of the Customer’s property (whether or not ASPECT is working on that part) where that damage is in whole or in part a consequence of a defect or weakness in that part of the property. – Any loss, damage or injury, whether direct, indirect or consequential, resulting from failure or delay in the performance of the Customer’s obligations in connection with the Contract. – The safety of both plant and machinery belonging to or hired in by ASPECT or its employees, agents or sub-contractors and shall indemnify ASPECT against its loss, theft or damage. 14.2 The Customer shall indemnify ASPECT against all actions, suits, claims, demands, losses, charges, costs and expenses which ASPECT may suffer or incur resulting from a failure or delay in the performance of the Customer’s obligations, undertakings, representations or warranties in connection with the Contract. 15.1 If the Customer cancels the Contract without ASPECT’s agreement other than pursuant to paragraph 3.3 above, subject to paragraph 15.3 below, the Customer shall indemnify ASPECT against all loss, damage, claims or actions arising out of such cancellation unless otherwise agreed in writing, and for the avoidance of doubt any such cancellation is without prejudice to ASPECT’s right to payment in accordance with paragraph 4 above or to the cancellation charges pursuant to paragraph 15.4 below. 15.2 If the Customer wishes to cancel an appointment for a visit by ASPECT, the Customer will incur a cancellation fee of £50 (plus VAT) if the cancellation is made 2 hours or less before the scheduled appointment time unless the Aspect engineer has arrived on site before notice of the cancellation is received by Aspect, in which event the Customer will be liable to pay a charge for one hour at the appropriate Aspect rate. 15.3 The Customer will be entitled to the following cooling off period: The period will apply with respect to planned non-emergency Works for which ASPECT has provided a written estimate which has been accepted by the Customer in writing and the contract price of the estimated Works exceeds £1,000. The period will be for a period of 14 days following the day of the Customer’s acceptance of the estimate, and the Customer may at any time during that period by written notice to ASPECT cancel the Works without any charge or penalty, subject to the cancellation charges referred to in paragraph 15.4 below and to the Works not having already commenced (with the agreement of the Customer). 15.4 When the Customer cancels Works, unless the cancellation is pursuant to paragraph 3.3 above, the Customer will be liable for (i) as a contribution to the bank and credit card charges incurred by ASPECT, 5% of any amount already paid to ASPECT and which is to be refunded by ASPECT, and (ii) as a contribution to the administration, demobilisation and other costs incurred by ASPECT, a charge of £50 (plus VAT) except that if greater, the charge is 5% of the estimate price if the cancellation is made less than 14 days prior to the specified commencement date for the Works, 10% of the estimate price if the cancellation is made less than 7 days prior to the said specified commencement date and 20% of the estimate price if the cancellation is made less than 2 days prior to the said specified commencement date. No waiver by ASPECT of any breach by the Customer shall operate as a waiver of any preceding or subsequent breach by the Customer. No variation shall be effective against ASPECT unless sanctioned in writing by ASPECT. No forbearance or delay on ASPECT’s part shall prejudice ASPECT’s rights and remedies under this Contract.